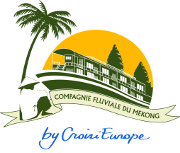 Owned by CroisiEurope, Compagnie Fluviale du Mekong offer more than traditional river cruising. Through charming vessels, you will explore rustic villages, discover hidden cultures and be one with the people. Charming, cosy and colonial-styled river boats. They are filled with character and they evoke memories of an era gone-by. Painstaking efforts have been taken to ensure a feeling f exquisite authenticity through the use of local materials, ranging from exotic tropical hardwood, palm wood and woven straw to give an elegant finish. Vessels are small enough to weave through seemingly inaccessible places such as the magnificent Gao Canal, an exotic gateway to the heart of Saigon city.